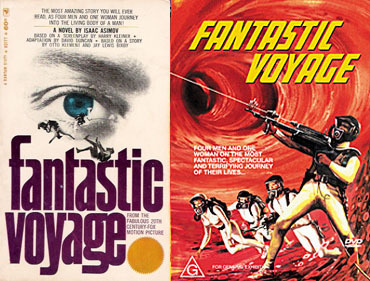 Technicalities of who-came-up-with-what aside, Asimov’s “Fantastic Voyage” is genuinely charming and engrossing, a page-turner of the highest degree. In it, Asimov’s prose has a rare chance to outshine his story-telling, lending complex imagery to a tale more easily presented in a visual media. It takes a master to turn an over-abundance of adjectives into a truly engaging story, but luckily Asimov knew what he was doing. better to see once than several times to read or hear!